Culture Days presents a weekend jam-packed with free hands-on and rarely accessed art and culture events and activities taking place across Canada from Friday, September 28th to Sunday, September 30th. Rhythm is the central theme for this year, and many events will highlight how percussion permeates artistic expression and nearly every culture around the world. No matter your age or skill-level, Culture Days is a chance to venture out to try something new or revisit existing creative passions - plus it’s just plain fun. OnBeat is the theme for the 2018 Culture Days Weekend. 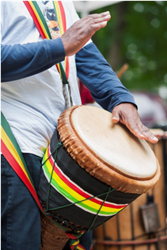 Presented by National Partner Sun Life Financial through their Making The Arts More Accessible™ program, OnBeat inspired events will showcase how rhythm exists in every culture and plays a key role in many art forms. Spontaneous dancing, clapping, and foot stomping is encouraged making OnBeat the perfect expression of what Culture Days is all about. Participants can also enter the Play OnBeat Contest ahead of the event weekend to learn more about rhythm in several art forms. By watching artist profile vignettes, and answering trivia questions, they'll have the chance to win great prizes. Each Culture Days event entices people to explore and support their local arts scene. Offerings include samba classes to instrument petting zoos, drum-circles to open choir rehearsals, behind the curtains of theatre to slam poetry showcases. Concerts, film fests, recording sessions, sculpture classes, song-writing workshops, and photography tours are just a sampling of what’s offered this year. Culture Days weekend puts the range of art and culture available in our communities’ front-and-center, keeps events free to help remove barriers to access, and brings the country together in creative celebration. Culture Days happens because hundreds of municipalities, library systems, individual artists, and community arts initiatives work together to offer a weekend of unique and accessible experiences. Last year alone, over 2 million Canadians enjoyed 7000 activities. Culture Days launches on Friday, September 28th and runs through to Sunday, September 30th across Canada. Venture out to the beat of your own drum! Visit culturedays.ca to learn more and find activities happening near you. Plan your Culture Days weekend using the Culture Days Bright Spots Schedule, a free, online customizable itinerary tool, made possible with the generous support of National Partner Sun Life Financial. For more information, hi-res photos, video, and more, check out our Media Kit. See the impact of Culture Days across Canada with our 2017 Infographic. Culture Days is excited to be hosting a national event to kick off the 2018 Culture Days weekend. Get OnBeat with rhythm-inspired interactive performances to kick off 2018’s national celebration of arts and culture. Revealing all of the highlights for Culture Days Manitoba and Nuit Blanche Winnipeg 2018, at the site that will be home to the featured works this year! There will be a drumming performance celebrating the 2018 Culture Days theme #OnBeat. Hosted CBC Manitoba’s Marcy Markusa. Speeches will be followed by a drumming performance by the Buffalo Gals to kick-off the Storytelling Day event. Visit mb.culturedays.ca for Manitoba event details. Taking the form of a street parade, the launch begins at Hall Street Plaza and ends at City Hall courtyard with speeches by local and provincial dignitaries and performances by groups including but not limited to, the Rhythm Ropers, In the Sticks, the Community Band, Orkastar, John Galm, Front Street Dance, Dance Umbrella, & Dance Fusion. Presented by Nelson & District Arts Council, The Civic Theatre and Nelson Kootenay Lake Tourism. Hosted by Vancouver-based vocalist, performer and BC Culture Days ambassador Mandy Rushton, the launch event will showcase a diverse lineup of cultural contributions including City Opera Vancouver, Indigenous Women Artists Collective, Vinica and City of Nations Society. The event gets started at 2pm with a welcome by Squamish Nation member Dennis Joseph & Canoe Family Performers and a Proclamation by Vancouver Mayor. Visit bc.culturedays.ca for British Columbia event details.